Ecology Ottawa is organizing a rally to raise awareness about the proposed Energy East pipeline through Ottawa and to call on governments to protect the Rideau River and the city from the pipeline’s potential adverse effects. They’re inviting people to walk or canoe with them to City Hall on Sunday, Sept. 29, 2013. The rally will start at 1 p.m. at City Hall. People who’d like to walk there together can meet at 9:30 a.m. at Vincent Massey Park and those paddling will gather at 9:45 a.m. at Brewer Park. 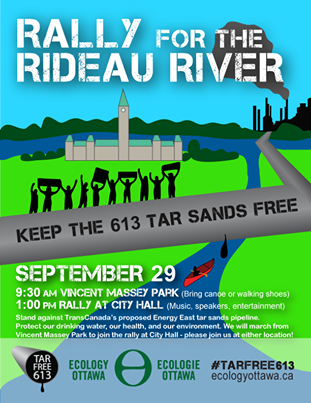 Scheduled to be at the rally are Ben Powless of Ecology Ottawa, Clayton Thomas Muller of Idle No More, Algonquin elder Albert Dumont, the Sierra Club of Canada’s John Bennett, John Stone of Carleton University, Frances Deverell of ClimateFast and other speakers, artists and musicians. According to Ecology Ottawa, TransCanada Corp. plans to convert a gas pipeline into a route for tar sands oil through Ottawa and across the Rideau River. Ecology Ottawa is asking the city and the public to reject the proposed pipeline because of the risks it poses to the water and food supply, ecosystems, climate and public health. You can find out more from them at http://ecologyottawa.ca/campaigns/tar-free-613/. There’s also a petition on their website at http://ecologyottawa.nationbuilder.com/tar_sands_oil along with other suggestions about how to get involved.